Paper presented (M. Severo, T. Giraud, N. Douay) to the 7th UK Social Networks Conference, London, July 2011. In 2010, an anonymous Internet contributor using the pseudonym Xuefangditu, or “real estate blood map”, compiled a list of all the violent evictions linked to property development projects in China and promoted it in his blog (http://t.sina.com.cn/bloodymap). This blogger’s motive was to denounce the rapid pace of Chinese urbanisation, which is destroying the lives of many citizens, and to create a movement to boycott those new developments where there had been bloodshed. The project consists of two maps (both based on Google Maps): an “open” version that anyone can add to or edit and a “revised” version edited by the blogger that shows only verified cases. Little volcanoes represent sites where people were evicted violently, with water canons or Molotov cocktails. Beds indicate incidents that resulted in at least one death. Flames indicate immolations. Every accident has to be supported by the link to an online sources document the event. After the verification of such sources, the blogger publish the accident in the revised map. All maps and sources are in Chinese. 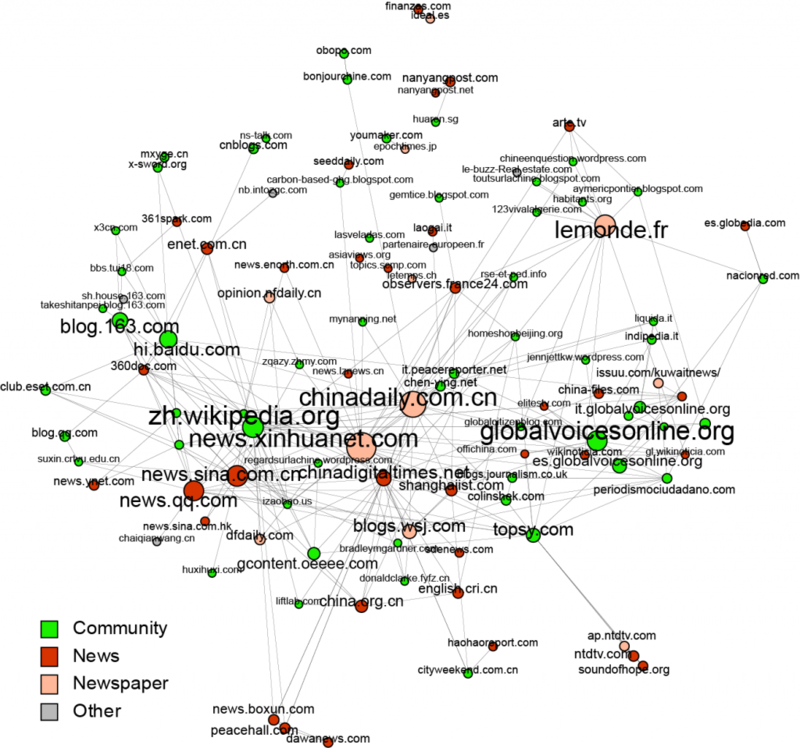 In our presentation, we used digital methods to explore the hyperlinks networks around the Bloody map of violent evictions in China and in particular the network of actors involved in the dissemination of the information published on the map. The analysis concentrates on two main aspects: (1) the network of websites that are mentioned in the map as sources of information; (2) the network of websites that talk about the map around the world.